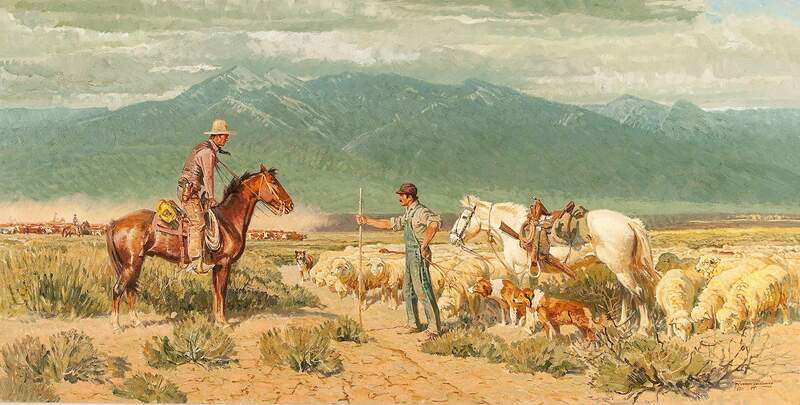 “Open Range Encounter,” a 30-by-60-inch oil on canvas by Robert Lougheed (1910-1982), shows tension between a range rider moving his cattle herd and a sheepherder and his dogs escorting a flock of sheep across the same landscape. This is possibly a carving of a sheepherder with a stomach ailment. It may be a self-portrait, or it may be a portrait of another herder, whom the carver was trying to make sick using magic and a spell. It was found in the San Juan National Forest along the Groundhog Stock Driveway. The first sheep brought into the American Southwest were Spanish churro sheep. 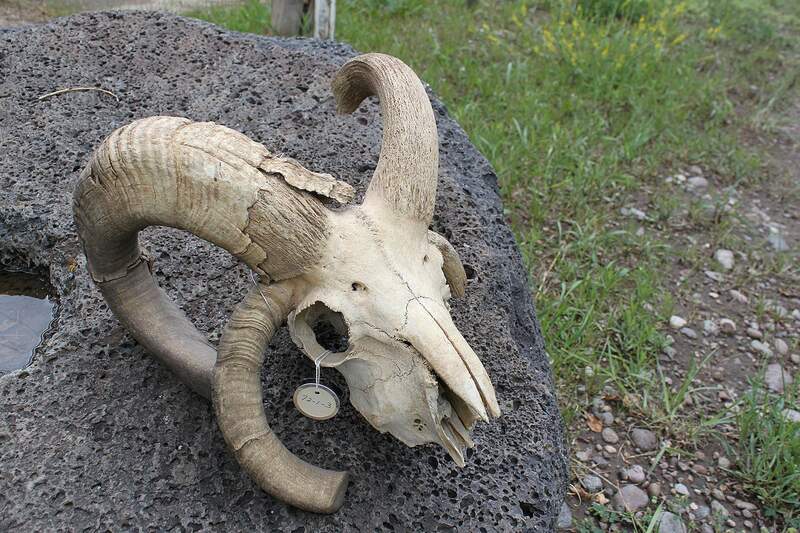 This historical churro skull, with its distinctive four horns, is from the collection of the Saguache Museum in Saguache on the northern edge of the San Luis Valley. Sheepherders endure wind, hail, rain, sleet and snow at high elevations when they are alone tending sheep. They must also be aware of dangers from lightning storms. 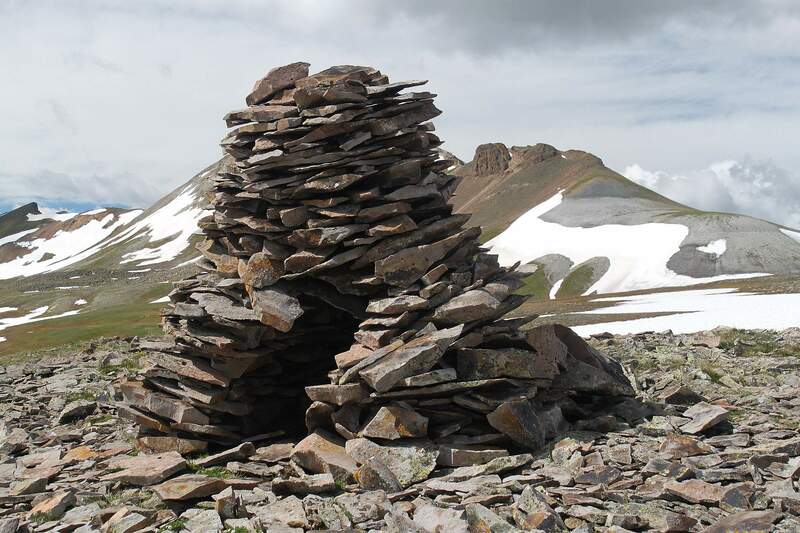 This enclosure or shelter along the Horsethief Trail between Engineer Pass and Ouray may have provided a small amount of protection for herders caught in inclement weather. From the Routt National Forest near Steamboat Springs to the White River National Forest east of Meeker, a Hispano herder from Taos, N.M., carved dozens of arborglyphs, including his signature house. This image is found on Ripple Creek Pass along the Flat Tops Scenic Byway. As a native Spanish speaker, he carved MN for NM because in Spanish the adjective goes before the noun. He also carved “repito,” which means “I am doing it again,” referring to his stylized houses. 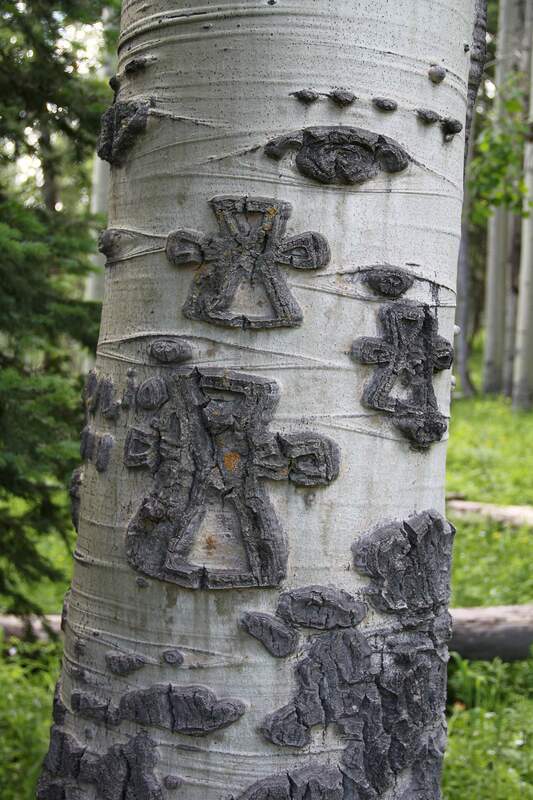 These Spanish Christian Maltese crosses, in a style that is more than 500 years old, were carved by Merejil Valdez on the San Juan National Forest south of Pagosa Springs. 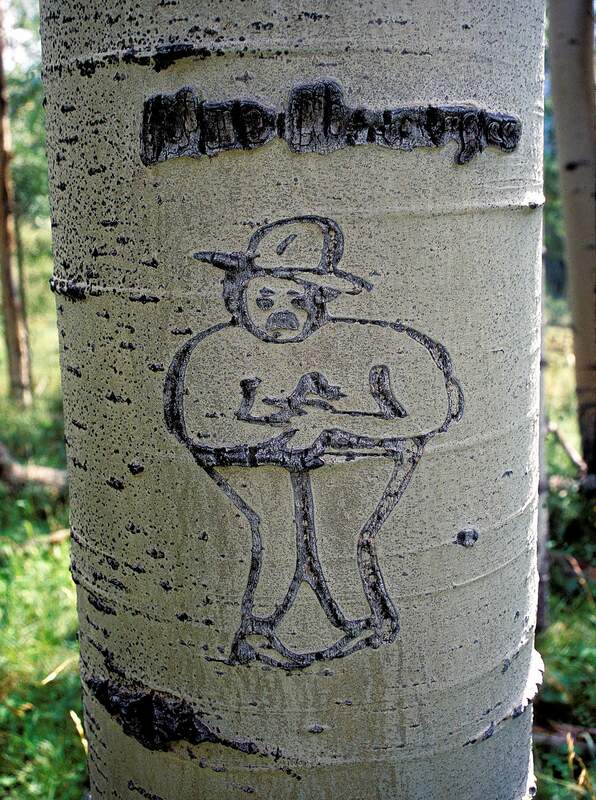 Religious iconography, though found on arborglyphs in aspen groves, is rare. Everybody writes about cowboys. Nobody writes about sheepherders. Of the hundreds of books written about cowboys and cowboying in the American West, there are few volumes on sheep and sheepmen. So I set out to write the first full-length history on the sheep and cattle wars in Colorado and modern sheep grazing on public lands. The book, “The Woolly West: Colorado’s Hidden History of Sheepscapes,” is published now. I hope I didn’t do a baaaaaaaaaad job. A lone sheepherder would be in charge of a band of about 1,000 sheep, and though he might have had a horse, it was really his dogs that kept the sheep in line, bedded them down and guarded them through the night against coyotes and bears. In the herding tradition, the morning star is the shepherd’s star – La Estrella del Pastor because herders rise in the dark. Cowboys get the fancy hats and hand-tooled leather boots. Sheepherders wear whatever they can find and carry a staff or crook to catch errant sheep by a rear hoof. It’s an ancient practice, far older than 19th-century cowboying and trailing cattle north to railroad terminus points as America moved west. Sheepherding stories and metaphors abound in the Bible and in diverse cultures worldwide, but I wanted to learn about sheep in Colorado, where they came from, how they arrived, who owned them, who herded them and what impact they have had on the environment for almost two centuries. HHHThis book began in an aspen grove as I studied carvings left by dozens of herders over decades. 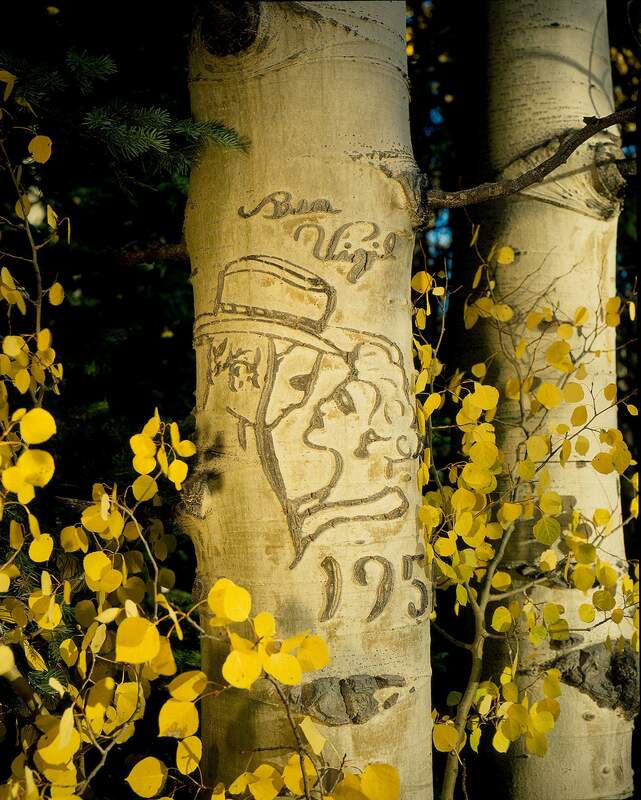 Some of the herders carved their initials each year they returned to the same grove. As I contemplated the carvings and thought of the baaing, blatting sheep moving through the smooth-barked aspen, I wondered – why were sheep hated? What was that deep-seated animosity against white, woolly creatures by cattlemen? This classic photograph depicts the attitude of sheepmen and their herders in the West, particularly Basque and Greek herders, in defending their flocks’ grazing rights on the open range. 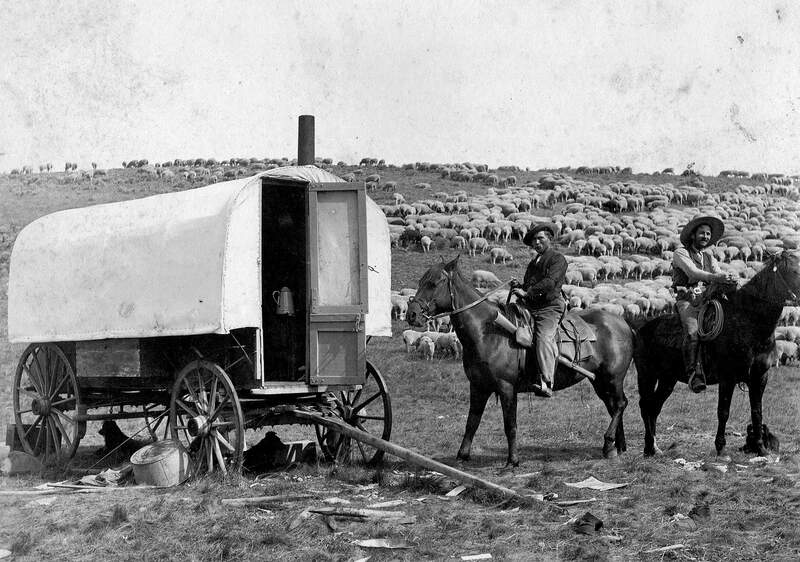 Why did cowboys prosper in poetry, folksongs and myth as rugged individuals, while sheepherders, who truly worked alone, are all but forgotten in the annals of the American West? Or when they are remembered, they are despised. Yet after the cattle and sheep wars finally came to an end by the 1920s, some sheepmen came to run cattle and some cattlemen chose to try sheep. As a historian, I know that the deeper you probe into primary sources and original documents, the broader the story goes. In Colorado history, there are a few villains and even fewer heroes. We used and abused the land in certain ways and now we know better. Like thread hand-spun from raw wool, I try to unravel the skein of people, place and purpose across Colorado’s high country. How did free range become government grass at the turn of the 20th century, and now in the 21st century, as we face global warming, climate change and probable long-term drought, how do we evaluate grazing permits in high alpine meadows? Should past practices be continued? And within the deeply woven story of cattle and sheep ranchers who own private land in Colorado’s mountain valleys, what are those family connections to soil and sheep and ranching traditions? How do modern ranch families persevere in a complicated world of competitive uses for high country they have always grazed? Colorado remains the third largest wool-producing state. As I seek answers and try to understand the language and culture of a few Basque, Greek and Hispano families who still raise sheep and graze them on public land, I am captivated by the tree carvings and the legacy of lone herders high in Colorado aspen groves, on foot or on horseback, etching names, dates, symbols, portraits of women and also carving the occasional curse. HHHA 100-year history of sheep grazing on Colorado public lands produced some interesting stories, some deep-seated quarrels and a new awareness of pioneer families who succeeded because of pluck, perseverance and a willingness to risk rain, snow, coyotes and cold nights alone, all in an attempt to raise lambs, put weight on the wethers and make an income twice yearly – from wool and from meat. 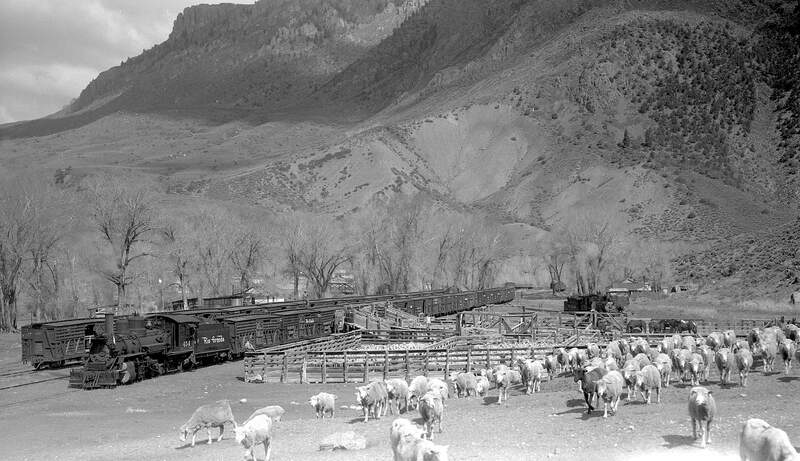 The Denver & Rio Grande, Colorado’s mountain railroad, off-loads sheep that herders will trail into the high country. Sheepmen often wintered their woolies near Canyonlands in Utah and then moved them by rail into Colorado for summer grazing. Indeed, Colorado has 15 streams named Sheep Creek and 19 peaks christened Sheep Mountain. Modern issues get tangled up when traditional pastures are bisected by hiking trails like the Colorado Trail, the Continental Divide Trail or any of the dozens of routes that bring backpackers into Colorado’s high country. What was once rural and remote is no longer. Friction exists between old-style ranchers just trying to make a living and urban vacationers out to experience nature, especially in wilderness areas like the Weminuche, Mount Zirkel, Flat Tops, Lizard Head, Big Blue, West Elk and Maroon Bells. The working landscape of high-country sheep grazing in the summer and winter range in the deserts of northern New Mexico, southern Wyoming or eastern Utah have all been modified. Sheep pastures are now leisure landscapes for tourists and wealthy second homeowners, who purchase expensive private lots near Vail, Telluride or Copper Mountain. The working West exists alongside an adventure-driven tourist-based economy. Where Colorado sheep once wintered in the broken canyon country between the Green and Colorado rivers, parts of that area are now Canyonlands National Park. Dynamite-blasted sheep trails are popular hiking and mountain biking venues by visitors who have no idea that lonely sheepherders once clutched cold coffee cups where they luxuriate in distant views. Thousands of alpine acres where sheep once grazed in large numbers are now federally protected wilderness areas with even more restrictions than national forests. Hikers having walked for miles into wilderness retreats seeking silence and solitude do not favor the sound or smell of sheep. HHHIn “The Woolly West,” I define sheepherder landscapes, or “sheepscapes,” such as carved aspen trees, stone cairns, wooden corrals in canyon bottoms and painted portraits in sheepsheds. To understand winter range for sheep, I’ve camped at the bottom of Rattlesnake Canyon, arriving by canoe on the Gunnison River. I’ve hiked into Escalante and Dominguez canyons where sheep and cattle conflicts erupted into a shooting war. 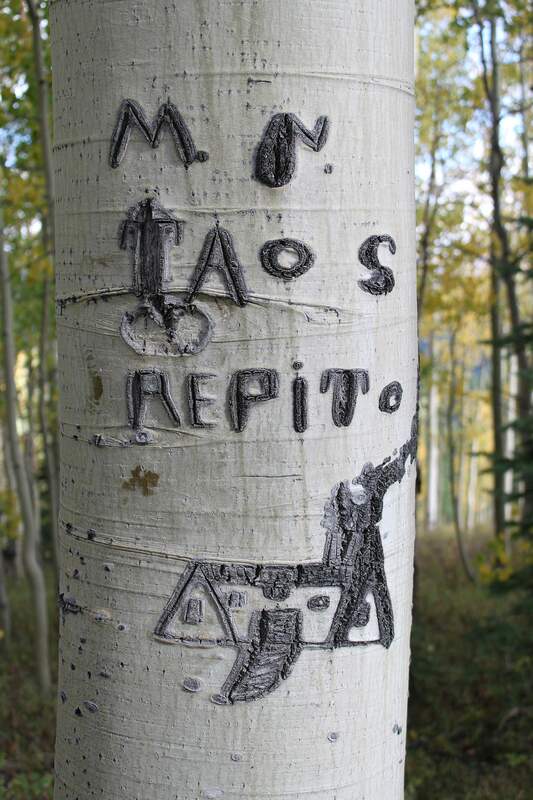 On the Mattern Ranch north of Steamboat Springs, Bill and Beth Sagstetter photographed a variety of arborglyphs. The sheepherder artist who impressed them the most was Ben Vigil, who carved this handsome couple. This tree and his other carvings can no longer be found. Photo circa 1980. High on the Flat Top Mountains, I’ve backpacked into camp among the lakes and meadows herders love and, by Jeep, followed old stock driveways from Colorado into Wyoming. In the San Luis Valley trying to hike into the Sangre de Cristo Mountains, I’ve been stopped by late-spring flooded creeks, which washed out a trail that would have taken me to a stone monument for a herder who died of a heart attack close to his sheep. As always, there is much to learn from landscapes in the West. In winter, I cross country ski up La Plata Canyon. Silence with snow. Aspens shorn of leaves. Low clouds drift overhead. I find again the aspen tree I’d been looking for. Robert Martinez carved his name on it and the date, 1953, the year I was born. That simple inscription across time and space brings me up short as it always does. For every day of my life, this aspen tree has been waiting for me, a herder left his name and a July date when he was there with a summer flock. I was born four months later. In many ways, I’ve written a eulogy – or perhaps a ewelogy. There are far fewer sheep grazing the high country of the San Juan Mountains now than in the early 20th century when just the Pagosa Springs district alone had close to 100,000 sheep. But if there are fewer sheep on Colorado’s public lands, Colorado lamb is now a high-quality product served in the nation’s best restaurants. I’ll talk about my research and tell a few tales at the Durango Public Library the evening of Nov. 15. Hopefully, some of the area’s sheepherders and sheepmen will also come, share the lectern and tell us more about the woolly West.